Les ressources dont vous avez besoin pour organiser vos séjours et vacances. Trouvez tout ce que vous devez savoir au sujet de vos destinations et passez au niveau suivant. This comparison article will help you to make an informed decision about choosing a yoga retreat in Thailand or a yoga retreat in Bali, depending on your yoga goals and holiday preferences. In Thailand and Bali, you’ll find a diverse offering of yoga holidays, yoga retreats, and yoga teacher training in various yoga styles and proficiency levels. Some of the most common styles you can practice in these destinations are Vinyasa, Ashtanga, Hatha, and Yin Yoga. Bali also offers an extensive selection of Kundalini yoga retreats. That said, it’s fairly easy to find a retreat that teaches your preferred style in both destinations. Some of the most qualified yoga teachers and instructors in the world hold retreats in Thailand and Bali, so you’ll get a high-quality yoga experience with whatever destination you pick. However, if you’re looking for a yoga teacher training, Bali has slightly more options to offer. What tends to differentiate the two destinations are the complementary activities rooted in the culture. Bali is the world-recognized health and wellness hotspot with many health activities offered. Its jungle village Ubud, located in the center of the island, is the hub for all things healthy where you’ll find yoga retreats, vegan raw food restaurants, and Balinese massage salons on every corner of the street. Ubud is an ideal location for combining a yoga retreat with complementary health-related activities as acupuncture, reflexology, aromatherapy, Ayurveda, or Qigong to relax and rejuvenate. Many of these health centers are relatively affordable, quintessentially stylish, and attract a young hipster crowd from Australia, the US, EU, and the UK. Rooted in the Thai culture, Thailand has a distinctive combat sport: Muay Thai. It combines both a physical and mental discipline, just like yoga does. 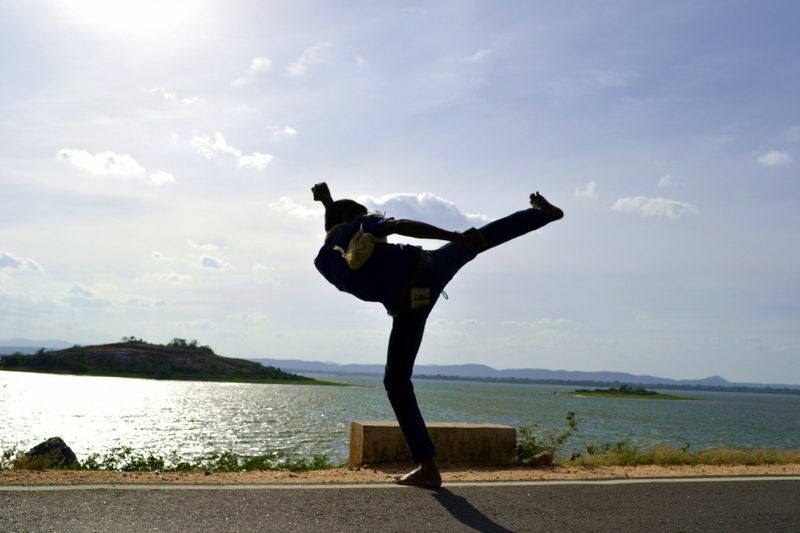 It’s therefore not uncommon that many yoga retreats offer complementary Muay Thai classes, helping you to increase balance, strength, and mobility. Other common side-activities are aqua healing and Thai massages, also known as the most ‘lazy’ form of yoga as your masseur is doing the stretching and yoga exercises for you. Thai massage can help you to lower your stress, boost energy, and stimulate blood circulation, so it’s a great addition to your daily yoga sessions. For yogis who want to experience activities beyond the yoga mat, retreats in both Bali and Thailand offer activities such as hiking, water sports, dancing, fitness, Pilates, or cultural activities such as local cooking classes. Even when affordable, yoga retreats at the beach feel like a luxury holiday: wake up in your private bamboo hut while watching the sunrise. And what’s better than a nice swim after a day filled with yoga, mindfulness, and meditation? Both Bali and Thailand boast picture-perfect white-sand beaches with crystal-blue waters and offer destinations for a perfect beach yoga experience. In Bali, head to Seminyak, Sanur or Canggu for a beach yoga retreat. In Bali, the common water sport is surfing, and plenty of retreats offer the option to combine your yoga with surfing. 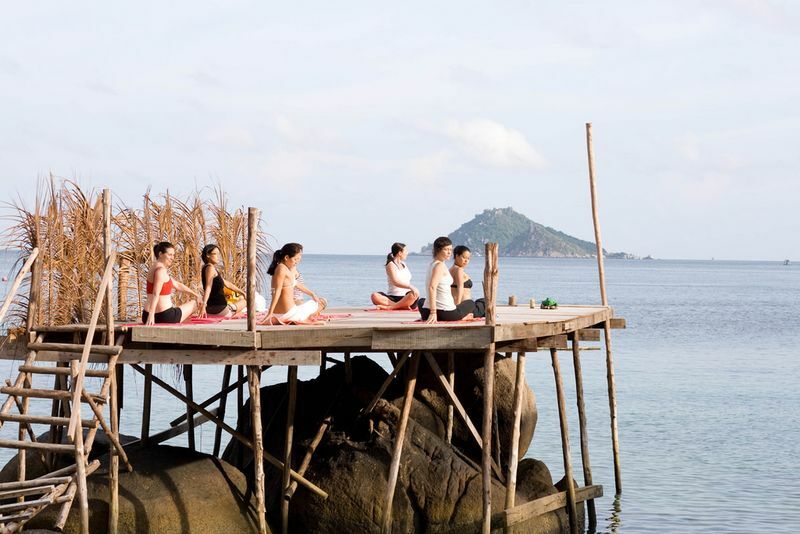 In Thailand, you’ll find yoga retreats at the beaches of paradise islands Koh Phangan, Koh Samui, or Phuket. The common water sports here are snorkeling and scuba diving. For those who’d rather like to practice their yoga in the humid jungle, both Bali and Thailand offer amazing retreats in the hot and sweaty climate. In Thailand, the northern region of Chiang Mai, Pai, and Chiang Rai is famous for its relaxing meditation & yoga retreats, where you’ll be secluded and surrounded by the rich Thai jungle. In Bali, Ubud is the place to go for a yoga retreat surrounded by lush green jungle and rice paddies. 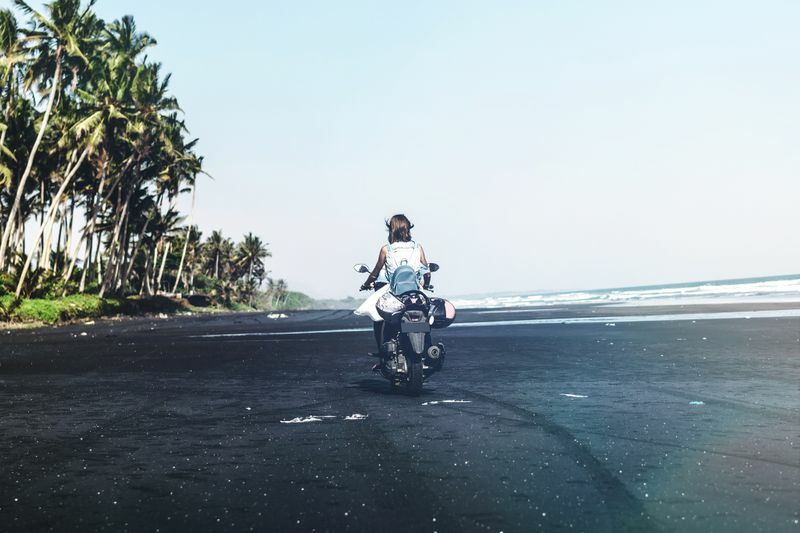 If you’re looking after an experience where you can combine both beach and jungle, it’s probably better to travel to Bali, as the distances between beach and jungle are a lot closer than in Thailand. Nevertheless, the jungle experience in Thailand feels more like a retreat from the inhabited world. 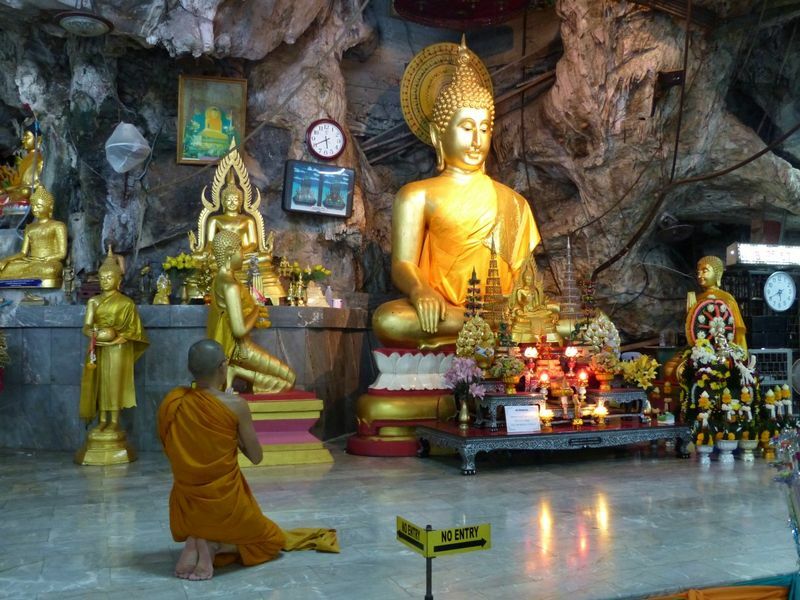 The laid-back atmosphere and warm-hearted hospitality of the Thai people are the results of their Theravada Buddhist roots, which is the main religion practiced in the country. This branch of Buddhism is quite unique compared to other Buddhist nations due to the influence of Indian and Chinese traditions. For instance, you might notice that many Thais wear amulets or carry talismans, despite the fact that Buddhism prohibits attachment to material objects. Thai people have a strong sense of shared traditions, cultural identity, and are famous for their respectful and polite greetings, including the gesture known as ‘the wai’ which looks very much like the yogic Anjali Mudra (palms pressed together in front of your chest). You’ll also notice that your yoga shala will most likely be decorated with Plumeria flowers, incense burners, and Buddhist offerings, which will help you to gain a sneak peek into Thai culture, and creates the type of ‘feel-good’ environment conducive to relaxation and yoga practice. Bali, the Island of the Gods, is the ultimate spiritual destination with Christian, Muslim and Buddhist communities, but the largest population is Hindu. Balinese Hinduism worships the main Hindu gods such as Brahma and Vishnu along with distinctly Balinese gods typically associated with the mountains, lakes, and the sea. Everywhere you go in Bali, you’ll see little handmade offerings for the many Hindu gods on the corner of every street and in front of almost every house or store. 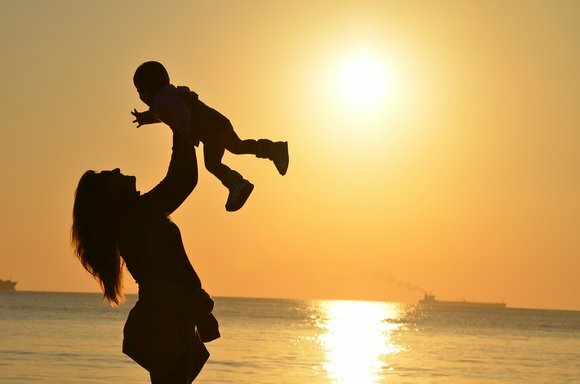 The Hindu lineage in Bali is one of the reasons why yoga teacher training, resorts, and retreats have flourished here to make it a hub for spirituality and self-development. Thai cuisine features naturally healthy and delicious dishes which are based on fresh ingredients and flavorful herbs and spices. Local cooks are very knowledgeable and passionate about their cuisine, which combined with fertile grounds with a variety of incredible produce, ensures that the meals on retreats are always something to look forward to. Expect creamy Thai curries, raw, crunchy vegetables and fruit, aromatic rice and spicy snacks. Even though Indonesian cuisine is quite heavy and meaty, Balinese cuisine is fresh and sweet. The Balinese grounds are gifted with thousands of lush rice fields, coconut palms, tropical fruit trees, coffee plantations, seas filled with fresh fish. 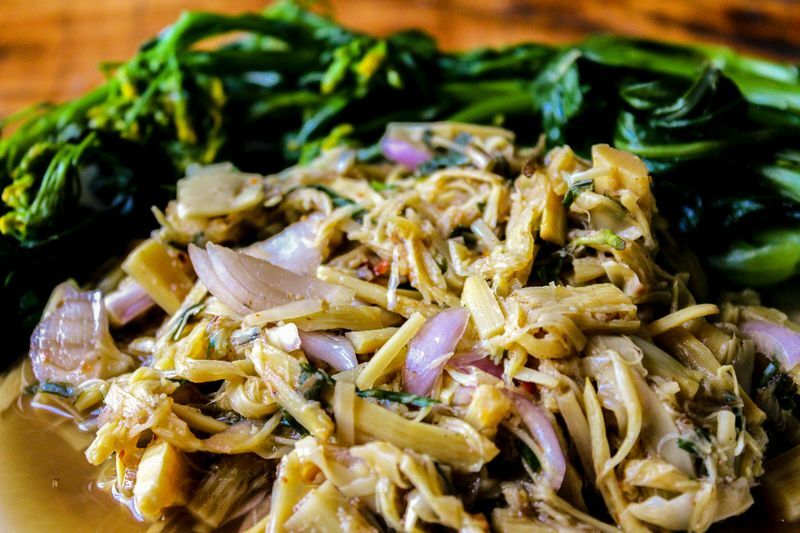 Due to the delightful fusion of Indian Hindu influenced spices and traditional Indonesian cuisine, the Island of Gods has something to offer both to vegans and meat lovers. Did you know? The warm, humid environment in Thailand and Bali helps you to stretch more deeply and makes all your joints feel lubricated, which is great for your yoga practice. In Bali, you can expect a tropical, warm and humid climate all year round with an average temperature throughout the year is 82 degrees Fahrenheit (28 degrees Celsius). 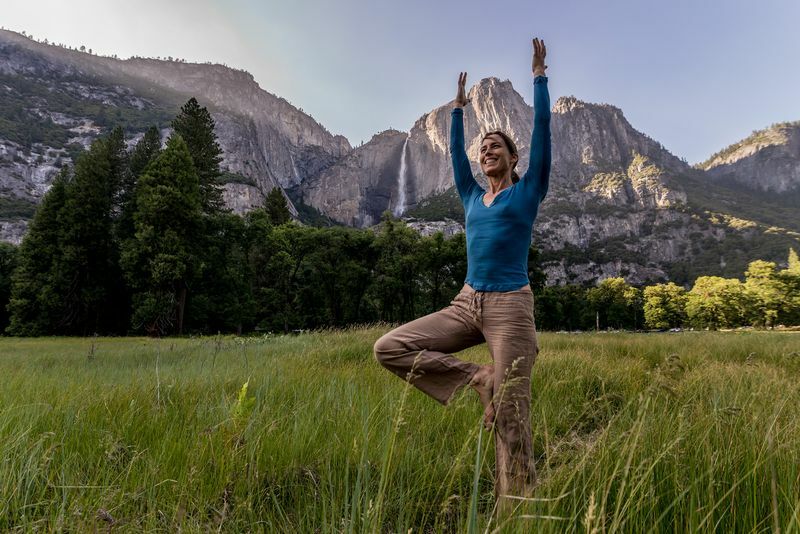 Due to such a favorable climate, there is an abundance of yoga retreats and holidays all year round. The months of April to September are considered most popular to travel to for visiting Bali. During these months in dry season, the air is slightly less humid, the island is more crowded with tourists, yet the atmosphere is still relaxed. For those who are looking for a relaxed yoga experience, the months from October to March are considered the best the deepen your yoga practice. In Bali's wet season the atmosphere is humid with torrential downpours, perfect for indoor practice. 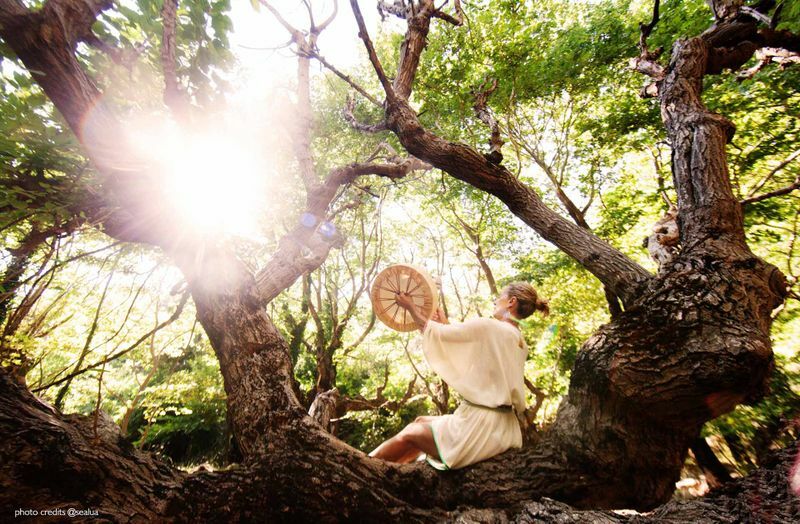 The island is at its quietest, thus it’s a great time for a spa experience or a yoga teacher training. It’s in these months that you can get a sense of Balinese life, and immerse yourself in the many Hindu festival celebrations happening around the island. The Thai climate can be compared to the climate in the south and central India. It’s great for yoga! You’ll be sweating constantly, which is a natural way to detoxify. Varying from the North to the South, Thailand is favorable for visiting all year round with an average temperature of 77-86 degrees Fahrenheit (25-30 degrees Celsius). The best (and busiest) time to travel to Thailand is during the cool and dry season from November and early April. In the northern jungles and hillsides, keep in mind that due to rainfall and high altitude, the temperatures can drop and you might feel a little chilly early in the morning, or late evening. Flying into Thailand or Bali: How to get there? Thailand is known as a super accessible destination with plenty of airports to fly into. The most popular Thai retreat destinations such as Koh Samui, Phuket, and Chiang Mai have their own international airports, making traveling from the airport to your retreat facility not taking too long. (Koh Phangan is an exception as you’ll need to arrive at Koh Samui airport). Some retreats and holiday organizers in Thailand offer airport transfers included in the price of the retreat, and there is always a chance to book an airport transfer for an additional fee. As Bali is a lot smaller and more secluded than Thailand, Bali only has one International airport, called Ngurah Rai International Airport (also known as the Denpasar Airport). Not all destinations in the world offer direct flights into Bali, and therefore most airports offer connecting flights from Kuala Lumpur or Singapore. Depending on your final destination, you’ll need to cover some extra transfer time to Ubud (±1 hour), Canggu (±45 mins) or Kuta (±15 min). Similar to Thailand, many retreat and holiday organizers in Bali offer airport transfers, which is a great way to easily get to your retreat destination. If you’re planning a shorter trip, spending a lot of time on internal travel can cut into your travel time significantly. Since Bali is notably smaller than Thailand, it’s quite easy to get around the island by car. So, if you only have time for a shorter trip, you can visit numerous areas and landmarks, as well as enjoy various attractions without spending much time on the road. You could even circle the island on a motorbike, which is quite a unique experience that could not be repeated in Thailand due to its larger size. Thailand stretches through 319 square miles (514 square kilometers), which means that you’re never going to run out of places to explore and get off the beaten track. However, in order to visit multiple destinations in a short period of time, it’s recommended to travel by plane to not lose a lot of time commuting. There are many inexpensive internal flights in Thailand ranging from 40 to 80 USD (1500 to 3000 BHT) offered by numerous budget airlines. In short, if you’re an active traveler and you’d like to visit multiple locations during your trip, Bali might be your preferred option. Yet, though it would require a bit more planning, it’s still possible to visit a couple of destinations within Thailand in a relatively short amount of time. An affordable or a luxury yoga retreat? The prices for yoga retreats in Thailand and Bali are comparable, but overall Thailand typically has more budget yoga retreats while Bali offers a larger selection of luxury holidays. However, you can find plenty of affordable and luxury yoga retreats in both destinations. Conclusion? Add both Thailand and Bali to your bucket list! Whether you’re deciding to go to Thailand or Bali, in any case, you’re making a good decision! As both destinations have a great yoga vibe, amazing weather and plenty of retreats offered, it’s with good reason that Bali and Thailand are among the most popular yoga holiday destinations. It’s highly suggested to experience both of these amazing destinations, so why not add both to your bucket list and experience them firsthand? Are you ready to take your yoga practice to the next level? 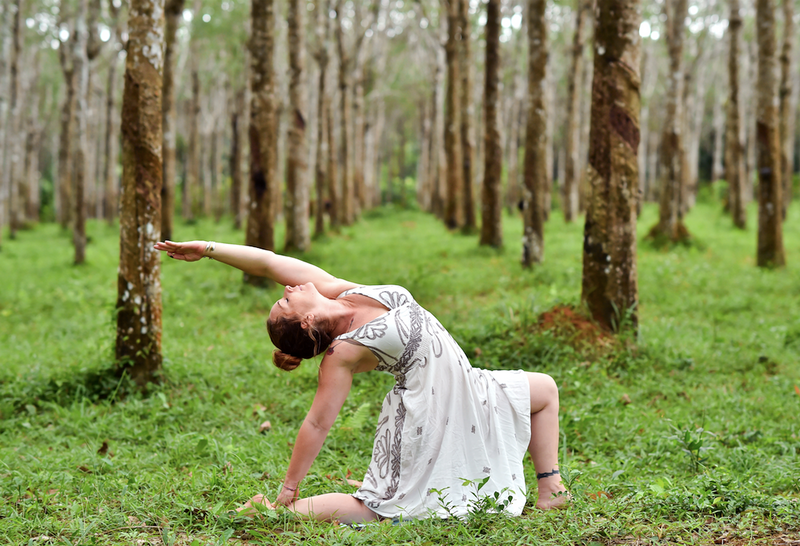 Check out our vast selection of yoga teacher training courses in Bali and Thailand! Maryna is a contributing writer at Tripaneer. She's also a passionate traveler and a healthy lifestyle enthusiast. Vous avez envie de découvrir de nouvelles histoires? Demandez à recevoir la newsletter de BookYogaRetreats et découvrez les nouveautés sur des destinations ainsi que des témoignages passionnants! Thinking of a stage de yoga?